Nandan Pahar - This is a small hill edging the town which hosts a famous Nandi Temple. It has been beautifully maintained by the local administration and speaks volume about the beauty of this place. This hill faces the famous Shiv temple.The Nandan pahar has a huge park for children.It also has a ghost house,a boot house,a mirror house and a restaurant. Basukinath - It is famous for its Shiva Temple, and the pilgrimage to Babadham is considered incomplete without paying homage at Basukinath. It is situated 43 km from Deoghar near the village of Jarmundi and connected by road. It is an indigenous temple bearing local art.
. In the south-west of Deoghar there is a big Ashram established by Sri Sri Anukul Chandra which is called Satsang Ashram. It is related with the sect of Radhaswami. It is a universal reforming Ashram and working for the betterment of humanity. People from India and abroad visit this Ashram every year. Naulakha Mandir - It is situated 1.5 km away from Baba Baidyanath Temple. It is a nice visiting spot. This temple looks like the temple of Ramakrishna in Belur. Inside it there are idols of Radha - Krishna. Its height is 146 feet. The amount spent in construction of the temple was about Rs. 900,000 (9 lakhs). Hence it became known as Naulakha Temple. Rama Krishna Mission (RK Mission) - a boarding school run by monks of RK Mission. The campus is full of greenery and has 12 football fields. The Ramkrishna Mission Vidyapith, a branch of Ramkrishna Mission, Belur Math, Howrah district, was established in 1922 with the objective of imparting modern education combined with the values of our ancient culture in the lines of the ancient Gurukula. Tapovan - Situated 10 km from Deoghar. There is a temple of Shiva which is the centre of attraction for pilgrims. 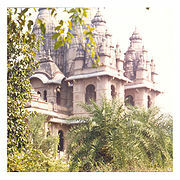 The temple of Shiva is called Taponath Mahadeva. A number of caves are found in this hill. In one of the caves, a Shiva lingam is installed. It is said that Sage Valmiki came here for penance. Sri Sri Balananda Brahmachari obtained Siddhi (success through penance) here. Rikhia Ashram - This Bihar School of Yoga (Sri Sri Panch Dashanam Paramhansa Alakhbarah) was established by Swami Satyananda Saraswati. Thousand of devotees from different corners of the world participate in an fair an annual festival and ceremony which is held in late November to early December. Foreigners are seen often in the town, especially between November and February. This ashram is indeed a sacred place and its charitable deeds greatly benefits the welfare of the local villages. Shivganga - Situated just 200 meters away from Baidyanath Temple. When Ravana was taking the lingam to Lanka, he felt the urge for urination. He handed over the lingam to a brahmin and went for urintation. After urination, he needed to wash his hands and be purified before holding the lingam. When he did not find any water source nearby, he made a blow with his fist on the earth and water came out and formed a pond. This pond is now known as Shivaganga. Harila Jori - Harila Jori is situated in the northern side of Deoghar, 8 km away from Baidyanath temple and 5 km away from Tower chowk. During ancient times, the area was full of Haritaki (Myrobalan) trees. This was the place where Ravana handed over the lingam to lord Visnu disguised as a brahmin, and went for urination. A stream flows here and is known as Ravana Jori. Trikuth Parvat - It is situated 13 km away from Deoghar on the way to Dumka. There are three main peaks on the hill which is why it is called Trikutachal. The height of this hill is 2,470 feet (750 m). There is also a temple of Shiva at this place known as Trikutachal Mahadeva Temple. It is the mouth of river Mayurakshi. Here we also find an altar of the goddess of Trishuli. It is an attractive place with a cool stream flowing. Now this is going to have Jharkhand's first ropeway. Koiridih- A historical place near river side has a English time rest house with thousands of teak wood forest beautiful mountain view which is surrounded by Dighariya forest and a nice dam is coming. This village had a famous Ghandian freedom fighter name Late Ayodhya Prasad Singh.